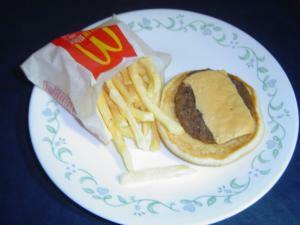 Photo taken 07/31/2015 of McDonalds Burger and Fries we purchased February 2013. Ask to see them when you come in for your next visit! Summertime means road trips and being constantly on the go for many of us. It can be easy to succumb to a quick snack in the drive-thru. We’ve highlighted 10 toxic ingredients found in McDonald’s food that will help you think twice the next time you’re tempted to stop at a fast-food establishment. 1. Acrylamide: This chemical comes as a result of frying food, especially potatoes. It is known to cause cancer and reproductive toxicity according to the State of California and is present in McDonald’s French fries. 2. Azodicarbonamide: This food additive is a chemical foaming agent and dough conditioner that is banned in most European countries. It can be found in many of McDonald’s buns. 3. Sodium acid pyrophosphate: Abbreviated as SAPP, this chemical may cause severe inflammation, dietary imbalances and osteoporosis. It is used as a leavening agent and can be found in McDonald’s hash browns, eggs, and tortillas. 4. Dimethylpolysiloxane: This chemical is used as an anti-foaming agent in cooking oils and can also be found in cosmetic products, silly putty, and even breast implants. It is present in McDonald’s French fries, McNuggets, and Filet of Fish. 5. THBQ: (Tertiary butylhydroquinone) is a petroleum-based chemical preservative that can be found in cosmetic products and McDonalds vegetable oil. 6. Sodium aluminum phosphate: This chemical has a possible link to Alzheimer’s disease and is found in the batter of chicken McNuggets. 7. Sodium benzoate: Mixed with artificial colors, this food additive may cause hyperactivity in children. It is found in many McDonald’s sauces and soft drinks. 8. Disodium 5-ribonucleotides: Those with gout or asthma should avoid this chemical found in McDonald’s chicken products and some sauces. 9. Sodium metabisulfite: This dough conditioner found in McDonald’s tortillas may be related to some diseases, health conditions and skin conditions. It can cause an allergic reaction in those with sensitivity to sulfites. This cheap, processed, corn derived sugar is a large contributor to the obesity epidemic that many Americans face. From croutons to soda pop, HFCS is found in a variety of McDonald’s food products. Article adapted from Top 10 Grocery Secrets.